Wondering how a social media channel can boost your ecommerce sales? Well, Instagram has the power to harness your conversion rates, while making your brand more visible and popular with the right strategy in place. Instagram was launched in 2010 as a social media platform for users to post images and videos. Within a short span of time, Instagram has expanded rapidly within the market and become a more brand-friendly website overtaking the popularity of Facebook and Twitter, rushing forward to the forefront of social media marketing. Why Instagram for Ecommerce Businesses? Social Commerce (aka Social Shopping) is the new ecommerce trend. Shopping through social media sites is estimated to have contributed to earnings worth $6.5 billion, a 24% rise in 2017 as compared to 2016 among the top 500 retailers. And Instagram has played a very large role in this growth. The Facebook-owned photo and video sharing platform has reportedly reached over 1 million monthly advertisers in 2017, which is five times more than what they had in 2016. 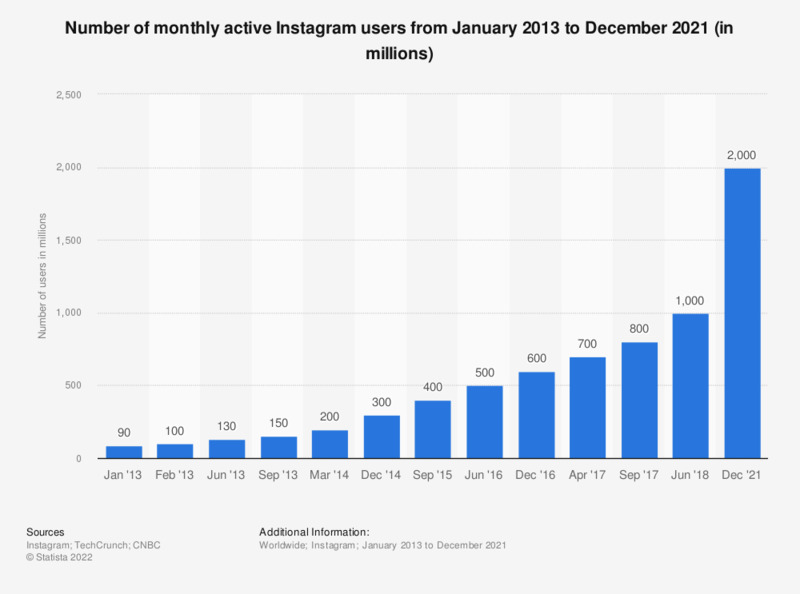 Here is a quick look at some of the latest statistics that prove why Instagram could be a key deciding factor for the success of your social media marketing. 800 Million Users – That’s a lot! 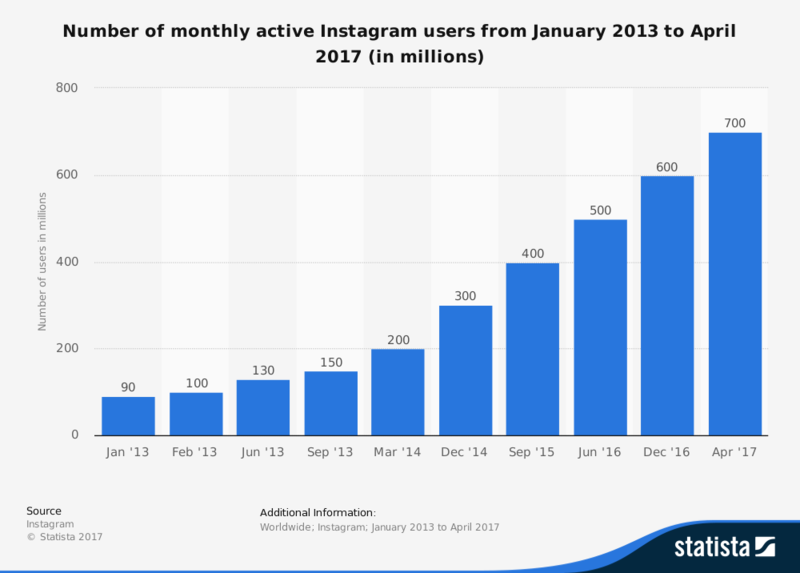 Instagram has doubled its user base to 800M active users within a span of 2 years, and is expected to reach 1 billion in 2018. 8M+ Global Brands are on Instagram – This is just the right statement to inspire your brand to share, promote, and sell products on Instagram while you target and engage customers. $7 Billion Ad Revenue in 2018 – Market Experts estimated that Instagram Ad revenue is expected to hit $7 billion in 2018, up from $5 billion 2 years ago. Your competitors are already on Instagram, advertising their products and you need to start immediately if you do not wish to be left behind. 78% of Influencers are Using Instagram – eMarketer reported that 78% of key influencers worldwide are using Instagram for brand collaboration compared to 2% using Facebook. 59% of Millennials are on Instagram – Instagram demographics have revealed that users aged between 18-29 years are the primary audience of Instagram compared to any other age group. These statistics are a great start to convince your ecommerce business to enter the visually appealing world of Instagram to share stories, promote products and improve your sales pipeline. However, without a solid selling strategy, it is not easy to boost your brand presence on Instagram. How to Use Instagram for Ecommerce? The key to driving more sales through social shopping via Instagram is simple – “Know what you want”. Whether you are focussing on advertising, user engagement or selling, Instagram has something for everyone. Innovative with visual storytelling through Instagram using images and videos to improve your brand popularity, thus boosting sales. Instagram’s ecommerce-friendly feature known as Instagram Shopping (available only in the US) enables sellers to promote imagery and add price tags on products, thus enhancing product discovery and enabling informed purchasing decisions for buyers. Here’s a quick guide on how to sell on Instagram, starting with how to create a profile to price tagging your products, including some tips to create interesting listings. Firstly, you need to authenticate your Instagram business account through your Facebook account and then connect your Facebook Business Page. Once you have a Facebook Business Page in place, you can create a business profile on Instagram. Simply, open your Instagram mobile app and under profile settings, click on convert to Business profile. Remember that you can only connect one Facebook Business Page to your Instagram profile; also only if you are an Admin of the Facebook Business Page. Once you create a business page, add a phone number, email address and store address to successfully complete the process. You can edit the profile at any point in time as well as update your business contact information as needed. Choose your business logo as the profile picture and include a link to your ecommerce website on your bio making it easier for your customers to visit your site. Once your business account on Instagram is all set, you can sync your product catalog from Facebook account with Instagram to enable Instagram shopping. All the product details, along with a link to the original product page on your website is imported – so you need to make sure your product information is accurate. Next, tag products to add a price tag on the right spot. You can add up to 5 tags per product. If you are pushing a product into the newsfeed of users to whom it is irrelevant, your Instagram sales strategy is purely ‘salesy’ and ‘spammy’. Identifying your target audience also helps identify key influencers with genuinely engaged followers. If you have just started with Instagram, we do not suggest you jump into selling your products straight away. Gain a large follower base by consistently posting visually-appealing imagery and interesting video clips, using smart hashtags to promote your content. Once you have a strong user base, you may then begin making your Instagram photos shoppable. Hashtags can be tricky. They can strengthen or break your strategy in no time. One great way to keep your audience engaged and promote your products is to create catchy hashtags that would be used by the influencers as well. Facebook Business reported that Ads with product reviews get four times more clicks compared to others. As a platform for visual storytelling through imagery, Instagram is a great place to showcase your brand and product reviews, making it the most effective platform to boost ecommerce sales. You can begin with launching an influencer campaign, setting a budget, followed by picking genuine influencers with quality content and followers. The next step would be to make a list of influencers and reaching out to them to discuss a strategy. Given their experience in promoting products, you may discuss a strategy to create catchy and optimized content for your brand. Instagram Influencer Marketing is expected to be a two billion dollar market by 2019. Influencer Marketing plays a key role in promoting and advertising your products via key influencers in your niche. Influencers can contribute to user engagement, brand awareness and promotion, customer acquisition, influencing purchase decisions and boost direct sales.